Whip yolks in a small bowl until they begin to lighten in color. Slowly, while whisking egg, add in olive oil in a small steady stream. Mayo will thicken. 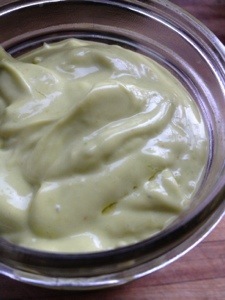 Using an immersion blender or small food processor, blend avocado into the mayo. Whisk in additional ingredients to taste.